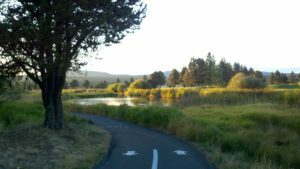 The Deschutes River is in Central Oregon, and is a major tributary of the Columbia River. I ride a bike along it or walk along it every day I am here. Studying horticulture has had nearly the same effect on me that colorization had on The Wizard of Oz. It’s as though the world used to be in black and white. Now that I know a little about the plants I am looking at, this place is in color for me. Did you know that Pinus contorta, for example, is a shore pine if it’s near the shore (and as the name suggests, it is contorted and twisty) but it is a lodgepole pine when it grows here? It was prized by native people for its tall straight trunk! My favorite plant here is the Greenleaf Manzanita. You know Arctostaphylos uva-ursi (kinnickinnick). This is also Arctostaphylos, but it is Arctostaphylos patula. Gorgeous red bark, small bright green leaves that seem to sit erect on the branches. Do you fall in love with the landscapes you see when you are away from home? The Kruckebergs brought home plants from their travels, and in effect, brought home scenery. One can find region appropriate plantings and recreate a “foreign” landscape in a portion of one’s own garden. Wander down the path to the Kruckeberg meadow and see if you can spot areas that are not Pacific NW Native. Near the river I see Typha latifolia, (cattail). I love the river. I don’t fish, but I always canoe when I’m here, and I’ve had some of the most terrifying fun of my life white water rafting on that river. This area is high desert, but desert is such a strange word to use for an area that is so lush with grasses and trees and animals; such a strange word for a place that has river sounds. There is the trill of the red-winged blackbirds on the cattails, the splash of the beaver, swimming with his head just visible above the water and then disappearing into the bank for the day. There are ducks, of course. Yellow fluff in spring, darker in autumn, with their ridiculous white bottoms high up out of the water. This morning there was a small group of deer. They came close; fairy tale close, Eden close—but not quite close enough to pet. A heron flew overhead looking like a pterodactyl, and I watched another fishing for breakfast. Coyotes hunt in the fields or stop and watch us. A huge blue dragonfly came to investigate me as I passed. Just before the bend in the path, there is a little wooden bridge over the river, which moves very slowly right there. Some seventeen years ago I first played “Pooh Sticks” on that bridge (I hope you’ve read Winnie-the-Pooh), and in recent years I have had occasion to play it again. One hangs over the side of a bridge and tosses in a handy stick or cone. It’s important for Pooh Sticks that the river move slowly, so that one has enough time to hurry across the planks to see whose stick or pinecone comes out first. I like a bridge over a gentle stream. The bridge makes me feel contented and safe. It’s civilization, but it isn’t factories. It’s a cottage-in-the-country kind of feeling, homey yet picturesque. There’s some kind of nostalgia connected to a small wooden bridge. I suppose that’s why so many people add them to their landscaping, needed or not. Glancing up from the bridge I can see mountains so far away they are blue, and the high bright sky, and in between there are the pastures that are vast enough to salve my longing for the ocean. That may be why I consent to come here so often and postpone my need for the salt spray and the limitless expanse of the seas. There is the quaintness of the little bridge and the still water and the ducks, and there is the spaciousness and grandeur of the far pastures and the mountains. There is the promise of bright fires and hot coffee a few steps away, and yet the knowledge that around a few more bends the river is not so tame.